As a pastor's kid, it's hard not to buy into the idea of the perfect family, a loving God, and amazing grace. But lately, Sam has a lot of reasons to doubt. Her mother lands in rehab after a DUI, and her father seems more interested in his congregation than his family. When a young girl in her small town goes missing, the local tragedy overlaps with Sam's personal one, and the already worn thread of faith holding her together begins to unravel. 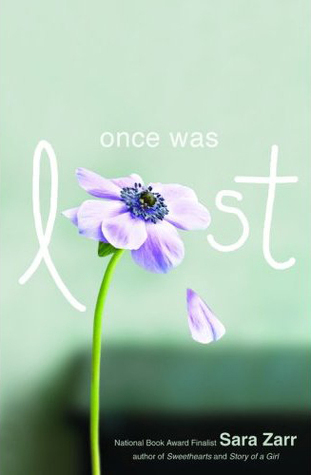 Once Was Lost is my first experience reading Sara Zarr and it certainly won't be my last. This book had the potential to be a complete disaster. A depressing premise and brooding first person narrator could definitely turn the reader off. But Zarr writes with such lyrical simplicity that it works without making you feel completely bummed out. Once was Lost is not just a coming of age story; it's also a faith-seeking journey. When the girl in the story goes missing, Sam, the first person narrator, also realizes that her faith in God has also gone missing. Having to deal with an alcoholic mother in rehab and a pastor father who makes more time for his parishoners than his own daughter, Sam has to make sense of all the trauma and difficulty on her own. As the novel progresses, the reader slowly realizes that there's more to Sam than just being a mopey, solitary teenager; she has managed to deal with all her family baggage with grace and dignity. Something else I really appreciated about this story was how Zarr threw away many of the possible predictable elements of the plot and took the reader on a truly authentic journey. There were so many moments that I thought that Zarr was foredhadowing foreboding, but I was pleasantly surprised that what I predicted didn't happen. Bravo Sara Zarr for going against a formula!